2001 was a year of many ups and downs. farms keep going out of business. we have an area where nutriontists and vets alike can not seem to eliminate cow health issues. cows don’t eat the amounts of feed that other areas, production still remains a challenge and sick and dying cows continue to plaque our farms. along with sick animals there also is a human health epidemic (too many cases of cancer). no one wants to investigate why so many farm families and people in and around these farms experiencing health problems. the michigan attorney general came to our area for a special report from chanel 7 out of detroit. there was enough voltage being placed in the ground by consumers energy to heat the fuel cells on 3 rockets that were shot off that day. run a train car around a track and lit a neon sign. Jennifer Granholm the attorney general questions ” if there is that much voltage in the ground and it only takes a small amount to stop the heart of a human, you have to wonder.” the attorney general’s court dates are due to come up this april. She is asking the public service commission to order consumers to update their utility system. successful farming had an article in the april 2001 addition of their magazine and a radio program.as a result, people from all over the us called to say they experience the same issues on their farms and have many of the same health problems. the infrastructure for electricity in the us was all put into place about the same time and in many areas has never been upgraded. this needs to be addressed on a national scale. when the demand for more electricity grew the utilities began the practice of leaching the unused current into the earth as way to relieve the preasure on the system and the earth became part of the circuit. there are no studies that show electricity in the ground is safe. We have contacted our us congrestional legislators making them aware of the situation and are working with them on some legislation for upgrading the us infrastructure. the new farm bill does contain a separate energy category. In the fall, gary nuell a new york radio program, did a show on electricity featuring, the mi attorney general’s office, dave stetzer, an electrician from wisconsin, Dr. Martin Grahman, who has studied this for more than 20 years and a medical doctor from florida who works with people experiecing medical problems from electrical influences. March 1998: Jackson County dairy farmer Gary Stetzer has a herd average of 21,300 pounds. June 1998: Severe windstorm uproots thousands of trees in Jackson County, knocking down power lines throughout the county. Stetzer notices a decline in herd health and milk production. June 1999: Neighbor farmer Mike Hansen has a neutral isolator installed on his farm to help solve his stray voltage problems. Stetzer and farmer Chuck Waughtal, who is located between the two farms, immediately notice problems with their herd. July 1999: Milk quality deteriorates rapidly on Stetzer’s farm. The somatic cell count rises 500,000 to 1.2 million, jeopardizing the farm’s Grade A status. Cows develop physical symptoms including open sores, enlarged hocks and lumps. Oct. 6, 1999: Jackson Electric Cooperative takes electrical measurements on the farm. The neutral line serving the farm returns 70 percent of the current. Cow voltage contact was measured at .5 volts, steady state, at 60 hertz. October 1999: Stetzer’s every-other-day milk pick-up dips to 3,992 pounds. Late November 1999: Jackson Electric begins work on about six miles of power line, which ends at the Stetzer farm. Dec. 10, 1999: Gary Stetzer’s every-other-day milk pick-up is at 5,107 pounds. Dec. 29, 1999: Work is nearly complete on the power line. Dave Stetzer measures a spike of .5 volts, peak-to-peak, cow voltage at 60 hertz. January: Gary Stetzer’s milk pick-up reaches 5,200 pounds. Feb. 1: Jackson Electric measures .2 volts cow contact, steady state, at 60 hertz. The new neutral line is returning 85 percent of the current from the Stetzer farm, 94 percent from the Waughtal farm. February: Stetzer’s dairy herd average is 19,400 pounds. Somatic cell count is 360,000. Commonly Cited Cow Responses to Electrical Shock were summarized by Appleman and Gustafson (3): 1) Intermittent periods of reduced production; 2) reasons unexplained; 3) increased incidences of mastitis; 4) elevated somatic cell count [in milk samples]; 5) lengthened milking times; 6) incomplete milk letdown; 7) extreme nervousness in milking parlor [stepping, or raising of feet, switching of tail, kicking off milkers]; 8) reluctance to enter the milking parlor; 9) rapid exit from the parlor; 10) reluctance to use water bowls or metallic feeders; and 11) altered consummatory behavior [such as lapping water or splashing rather than normal drinking behavior]. Authors observed effects of stray voltage on four general areas: milking performanceand behavior, herd health, nutritional intake, and yield of product. Reproduction should be added to the list. Cows exhibit clear responses to applications between 2 and 4 mA of current according to Scott, Gorewit, and Drenkard (21). Variation between responses of cows to 4 and 8 mA shocks was large. Same cow response differed markedly to the same current on different days for Drenkard et al. (7). Electricians commonly include a 500 Ohm resistor in the circuit when measuring voltage in areas of cow contact as if the resistor represents resistance of the cow. Ohms should be at least 250-500, although resistances presumably change regularly as a cow picks up one or more feet either in walking or attempting to escape electrical current. Further, if the filament of a light bulb represents resistance on the circuit, then the heat and light produced by the resistor hardly can be considered no consequence in the circuit. A possible relationship between regular low amperages, e.g. 1 or 2 mA, causing pain (hot-foot ? ), separation of hoof laminae, abnormal hoof growth, and other anomalies associated with stray voltage on farms cannot be ruled out by published research. Use of resistors in voltage meters would underestimate likely effects of low voltage on cattle. Also, transient voltages measured during low peak usage often increase significantly in late afternoon when heavier loads are consumed from same lines in the neighborhood. In the latter experiments of Lefcourt et al., (14) 28% of the cows (2 of 7 cows) became so distressed by 10 mA electrical current that they could not be handled safely and had to be removed from the experiment. And Gorewit et al. (8) reported that 2 of 30 cows in one test and 4 of 44 first parity cows in another test refused to drink at 4, 5, or 6 V for 36 h and were given an alternative water source; that cows might have died should be part of the outcome. Such difference may not be statistically significant but may be economically significant (loss of $7,200 in cows plus $18,000 of milk) with no other water source available as under farm conditions. Similarly, Aneshansley et al. (1) reported to the American Society of Agricultural Engineers, (ASAE #87-3034, page 6, Milk Production)–“week 5 was significantly lower than week 2 for all cows that received voltages greater than 0.” The authors’ graphic presentation of “Milk Production Decline,” Figure 11, is in the Appendices. Milk production changed (up to 3.5 kg/day) and at all voltages: 0.5, 1, 2, and 4 volts compared to the controls. Weeks 1 and 2 were pre-trial adjustment, weeks 3, 4, & 5 were voltage treatments, and weeks 6 & 7 were posttreatment. Trends were apparent for “Water Consumption,” Figures 2A vs 2B (Appendices), “Feed Consumption” Figures 12A vs 12B (Appendices), and possibly “Milk Fat” Figure 14A vs 14B (Appendices). Gorewit et al. (8) on the same experiments in the Journal of Dairy Science did not mention the significant differences at week 5 and did not present the graphic figures from the ASAE report. However, they did report that two animals receiving 4 volts did not drink for 36 h, at which time their voltages were disconnected. [And] “All other animals drank within 36 h and showed no significant long-term difference in the monitored parameters.” This is not consistent with the Aneshansley report (1) where milk production was affected by a wide range of low voltages. Addition of 44 more cows to their numbers for a 2 d water and feed consumption and milk production “experiment” where they found four more cows that did not drink for 36 hours drew their conclusion: “… no significant long-term difference in monitored parameters.” Variances, small numbers, and limited time exposure render contribution doubtful for describing on-farm expectations from stray voltage. For these, differences between groups for published 305-d lactations were surprisingly small as if means were restricted from varying as they would with normal residual variation among cows. Authors’ conclusion that none of voltages 0, 1, 2, and 4 V affected milk production 7312, 8527, 6938, and 7725 kg probably should elaborate that design did not enable such evaluation through this trial. Conclusion that voltage did not affect milk yield may have misled where it was testimony by expert witnesses in court. Milk fat was depressed from voltages (Aneshansley et al. (2)) during measurement of cow sensitivity to electricity during milking. “Milk fat was lower when currents were applied to first lactation cows [-.2%] and significantly lower [-.5% (p<.05)] for multiple lactation cows.” Decreases of fat test reduced the market value of milk at least $.20 to $1.60 per 45.5 kg of milk sold; $40 to $320 per cow for a typical herd averaging 9,091 kg milk/cow/year. Similarly, milk fat was less for all voltages (1, 2, and 4 V) vs 0 controls in the full lactation trial by Gorewit et al. (9, Table 2). The average percent for the three periods given for 2 volts is miscalculated and should be 3.7% rather than 4.0%. Average for controls was 3.8% fat in milk. Milk fat depression is a common response to heat stress (24), and apparently it occurs in cows subjected to electrical stress as well. Depressed milk fat is common in farm herds subjected to stray voltage, but it has been attributable to variations of dietary fiber and electrolyte imbalances, not mentioned in the Cornell reports but assumed to be equally distributed among treatments. Because cows were fed supplemental grain individually from an automatic transponder feeder, differences in amount of grain fed could have affected fat test. Depression of milk fat by electrical stress, if real, may be further supporting evidence of the adrenocortical stress syndrome as increased blood cortisol is produced by electrical stress. Effects on Health and StressRelated Disorders: Persistent, intermittent electrical shock produces typical stress syndrome characterized by increase of blood adrenal hormones: cortisol (hydrocortisone) (7) and epinephrine (adrenalin) (7,14). Henke Drenkard and Gorewit, et al. (7) found blood cortisol increased by 4 and 8 milliamps (mA) electrical current applied for 5 of every 30 sec during milking. While increased mean cortisol of 4 mA treatment during milking (6.44, 8.78, and 10.86 ng/ml) was not different from controls, with 6 cows and treatments switched every 8th day for 3 wk, (p>.05) a trend is apparent, and the 8 mA group mean was significantly different. Cortisol continued to rise for 16 to 20 h posttreatment when means were 13.25, 14.31, and 18.38 ng/ml for the 0, 4, and 8 mA shock. More somatic cells in milk of cows from the control group suggest that mastitis might have played a role in the controls as evident by the larger SCC standard deviation and its possible effects on blood cortisol and statistical analysis. The authors noted that: In work prior to this trial, most cows exhibited behavioral responses to electrical current at 4 mA. Calculation (22) of “sample size” necessary to show significant differences between controls and treatment means for the measured “Services per Conception” where treatment means and SEM(standard error of the means) are in Table 2, p. 2729, revealed that 48 cows per treatment would be required to show significant differences ( p<.05) to be sure that means will be significantly different 90% of the time. In the USDA (14) experiment, blood glucocorticoids of 0 mA controls were abnormally elevated, nearly twice baseline of treatment groups (controls=13.9 baseline) compared to treatment baselines of 9.9, 6.0, 6.0, 6.9, and 8.3 ng/ml for 2.5, 5.0, 7.5, 10.0, and 12.5 mA treatments for 10 seconds, 1 hour prior to milking. These high cortisol controls made significant differences between treatment baseline-minus-peak versus controls impossible for any voltage treatments with “standard error of the mean (range) 4.5-5.5 ng/ml.” Results were based on seven cows divided into two groups shocked bi-weekly. Calculation of the sample size required to show statistical significance indicates that 25 cows per treatment would have been required to be sure that means are different 90% of the time (22). Otherwise, the experiment provides no scientific basis for claiming that any voltage had “no significant effect” on the hormones measured. The inadequate controls and small number of cows would not allow any other conclusion, except that two cows became so unmanageable as to endanger workers at 10 mA that they were not subjected to 12.5 mA currents, and the experiment was terminated without completing its objective. Unmanageable cows were labeled “exceptional” as in the Cornell reports, although they represented 28% of the cows on experiment. Reproductive Efficiency may be inhibited by electrical stress because repeated acute stress, with a brief significant rise of blood cortisol, can disrupt the preovulatory luteinizing hormone (LH) surge and ovulation in heifers (23) such as caused by transportation or severe climatic conditions. These authors noted that previous investigators have found that ACTH, cortisol, and progesterone, also released by the adrenal cortex, can inhibit LH surge in the cow. Wilson et al. (27, 28) confirmed that controlled heat stress inhibited ovarian function and reproductive efficiency in cows and heifers by inhibiting follicle growth and development and increasing incidence of delayed regression of corpus lutea. 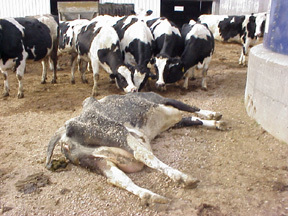 Reproductive failure is a common complaint in herds affected by stray voltage and can have severe economic consequences by reducing the number of off-spring born, culling opportunity, and eventual number of cows in the herd. Increasing adjusted calving interval resulted in net revenue losses of $7.33 (US) per cow/day in a study of the economic effects of reproductive efficiency (20). Data in the Cornell (10) study were too limited for valid conclusions regarding effects of electrical stress on health and reproduction. Also, cows that were not seen in estrus within 50 d after calving were given prostaglandins F2-alpha to destroy the corpus luteum, stimulate estrus, and were inseminated in 5 to 7 d. This procedure corrects the delayed (retained) corpus luteum problem caused by stress as described by Wilson et al. and, therefore, corrects the problem supposedly being measured by the experiment, rendering it invalid and unrelated to objectives of the experiment. From the means and variances for services per conception, 48 cows per treatment would have been necessary to obtain statistical significance and be sure that means would be different 90% of the time. Again, the few cows and large variation limit data and concluding “no significant difference” can be misleading. Effects on Resistance to Disease: Increased blood cortisol caused by persistent stress, such as prolonged intermittent electrical shock, results in an immediate leukocyte shift, longer adrenocortical fatigue, and eventual reduction of peripheral white blood cells. Serial injections with 100 and 200 IU of ACTH to stimulate adrenocortical hormones reduced phagocytosis (engulfing) of bacteria (staphylococcus aureus) by white blood cells 43% and 56% after the sixth injection through a combination of decreased lymphocytes and decreased phagocytosis, as demonstrated by Paape (17) and (18, Tables 3, 6, & 7) and Gwazdauskas et al. (11). ACTH is the hormone produced by the pituitary gland, at the base of the brain, in response to stressful stimuli. It stimulates the increase of cortisol and other hormones produced by the adrenal glands. ACTH injection and heat stress of cattle produced similar moderate leukocytosis and increases in somatic cell counts of milk in Arizona studies (24). Electrical stress from stray voltage may be similar to heat stress in which both feed and water consumption dramatically were reduced, and milk energy output declined nearly twice as much as digestible energy intake, resulting in marked decrease of efficiency of utilization of energy, and in considerably higher maintenance energy requirements (15). Corresponding protein catabolism via gluconeogenesis, electrolyte imbalances, atrophy of the thymicolymphatic system and gastrointestinal ulcers are all known consequences of adrenocortical stimulation caused by such noxious stressors as exposure to extreme cold, heat, xrays, burns, intense sound or light, pain, forced muscular exercise, starvation, hemorrhage, and anxiety. Electrical shock now can be added to the list of common stressors. Eventually, we may learn that electrical shock may be a contributor to abnormal incidences of metabolic disorders, lameness or bone disorders, and an immune deficiency syndrome similar to AIDS in humans. Water and Feed Consumption: Craine (6) reported that water consumption from a watering trough charged with 6.0 volts was 68% less than from the zero volt trough, and 48% less for the 6.0 volts than from a 3.0 volt trough. Three volts reduced water consumption about 20%. Norell et al. (16) taught cows to escape from 5.0 mA treatments over a front to rear hooves pathway. During the test, cows were exposed from 1.0 to 5.0 mA. Cows expressed the learned escape behavior in 23% of 2.0 mA current treatments and 97% of 5.0 mA treatments. When the same series of current treatments was applied over a mouth-to-all hooves pathway, cows responded to 15% of 1.0 mA treatments and to 90% of 5.0 mA treatments. In contrast, Cornell workers claimed no significant differences in milk yield or composition, health and reproduction, or water consumption (1, 9) of cows exposed to 0, 1, 2, or 4 volts at their waterers. In the Journal of Dairy Science articles, authors claim that results were based on 40 cows (10 cows per treatment group) for complete lactations. However, five months were required to complete filling the treatment groups with 10 fresh cows as designed, and apparently, according to research notes of the trial furnished by the authors under Court Subpoena, 141 cows were actually in the pens during the trial, and cows were put in the wrong pens 16 times during the trial. Water consumption was measured for the whole pen, not for individual cows; and cows were observed drinking from the waterers over the fence from outside the electrocution stall. Therefore, water consumption reported has no direct relationship to milk production of experimental cows because nonexperimental cows occupied spaces to keep the pens full.Gorewit et al. (9) stated that average current (and ranges) for 2 d (randomly selected) were 3.1 mA (4.5 to 1.5), 6.5 mA (8.6 to 4.6), and 11.2 mA (14.1 to 7.5) for the 1, 2, and 4 V pens, respectively in the Cornell experiment. Evidently current was not monitored regularly. In view of results by others, design of the Cornell trials must have permitted meager exposure of cattle to electricity for outcomes to have differed so from reports of decreased water, feed consumption, and milk yield. E=IR, where E is volts, I is current flow (amperes), and R is resistance of the circuit (Ohms). Then, volts divided by resistance equals amperage. .5 volts/250 Ohms = .002 amps x 1000 = 2 milliamps current. Because individual animals respond differently, arbitrarily selecting a predetermined voltage or amperage as safe for all animals seems foolish and irresponsible. Economic consequences occur when as little as 2 of 37 or 2 of 7 of the cows in a herd are afflicted by stray voltage. The Attorney General of Michigan concluded (Re: Michigan Electric and Gas Association, Case No. U11368, October 15, 1997) that the Michigan Public Service Commission does not have the statutory authority to approve rules to regulate the levels of extraneous electrical current, which attempt to authorize utilities to spread unwanted and detrimental electrical power (voltage and/or current) outside of contractual easements onto private property to the detriment of the health, safety and welfare of both people and animals, and to the detriment of the use and enjoyment of property. The Attorney General’s opinion was in response to a request by Consumers Energy Company for the PSC to rule that 2 mA electrical current or less was not harmful to livestock, and, therefore, plaintiffs claims could not be brought to litigation. Scrutiny of the published articles cited in A Review of Stray Voltage Research, Effects on Livestock, by Robert J. Fick and Truman C. Surbrook, does not support their conclusion that 2.0 or less milliamps current from extraneous voltage is harmless to dairy cows and of no economic consequence to dairy farmers. Much of the data are unreliable and irrelevant to voltages found on farms and are misleading to an unsuspecting public. Appreciation is expressed to Dr. Lon D. McGilliard, Professor Emeritus, MSU, and former Editor, Journal of Dairy Science, for editing the manuscript, and to Oleg Makhnin, Consultant, Department of Statistics and Probability, MSU, for assistance in evaluating published data. 1.Aneshansley, D. J., R. C. Gorewit, D. C. Ludington, and Z. Xin. 1987. Effects of neutral-to-earth voltage on behavior, production and water intake in dairy cattle. Paper No. 87-3034. American Society of Agricultural Engineers. Baltimore, MD. 1987. 2.Aneshansley, D. J., R. C. Gorewit, and L. R. Price. 1992. Cow sensitivity to electricity during milking. J. Dairy Sci., 75:2733-2741. 3.Appleman, R. D., and R. J. Gustafson. 1985. Source of stray voltage and effect on cow health and performance. J. Dairy Sci., 68:1554-1567. 4.Behr, Michael. Forensic Economist. 1997. Stray voltage research fraud. Proprietary publication by the author. Northfield, Minnesota. 5.Bodman, Gerald R., P.E. 1992. Comments on Stray Voltage Technical Issues. Presented before the Minnesota Department of Public Service in its Stray Voltage Rulemaking Docket No. E-999/R92-245. 6.Craine, L. B., M. H. Ehlers, and D. K. Nelson. 1970. Electric potentials and domestic water supplies. Agricultural Engineering, 51(7):415-417. 7.Drenkard, D. V. H., R. C. Gorewit, N. R. Scott, and R. Sagi. 1985. Milk Production, health and endocrine responses of cows exposed to electrical currents during milking. J. Dairy Sci., 68:2694-2702. 8.Gorewit, R. C., D. J. Aneshansley, D. C. Ludington, R. A. Pellerin, and Xin Zhao. 1989. AC Voltages on water bowls: effects on lactating holsteins. J. Dairy Sci., 72:2184-2192. 9.Gorewit, R. C., D. J. Aneshansley, and L. R. Price. 1992. Effects of voltages on cows over a complete lactation. 1. Milk yield and composition. J. Dairy Sci., 75:2719-2725. 10.Gorewit, R. C., D. J. Aneshansley, and L. R. Price. 1992. Effects of voltages on cows over a complete lactation. 2. Health and reproduction. J. Dairy Sci., 75:2726-2732. 11.Gwazdauskas, F. C., M. J. Paape, D. A. Perry, and M. L. McGilliard. 1980. Plasma glucocorticoid and circulating blood leukocyte responses to cattle after sequential intramuscular injection of ACTH. Am. J. Vet. Research, 41:1052. 12.Lefcourt, Alan M. 1982. Behavioral responses of dairy cows subjected to controlled voltage. J. Dairy Sci., 65:672. 13.Lefcourt, Alan M., and R. Michael Akers. 1982. Endocrine responses of cows to controlled voltages during milking. J. Dairy Sci., 65:2125. 14.Lefcourt, Alan M., Stanislaw Kahl, and R. Michael Akers. 1986. Correlation of indices of stress with intensity of electrical shock for cows exposed to electrical current milking. J. Dairy Sci., 69:833-842. 15.McDowell, R. E., E. G. Moody, P. J. Van Soest, R. P. Lehmann, and G. L. Ford. 1969. Effect of heat stress on energy and water utilization of lactating cows. J. Dairy Sci., 52:188. 16.Norell, R. J., R. J. Gustafson, R. D. Appleman, and J. B. Overmier. 1982. Behavioral studies of dairy cattle sensitivity to electric current. Transactions of the ASAE, 16(5) 1506-1511. 17.Paape, M. J., D. W. Carroll, A. J. Karl, R. H. Miller, and Claude Desjardins. 1974. Corticosteroids, circulating blood leukocytes, and erythrocytes in cattle: diurnal changes and effects of bacteriologic status, stage of lactation and milk yield responses to adrenocorticotropin. Am. J. Vet. Research, 35:355, vol 3. 18.Paape, M. J., F. C. Gwazdauskas, A. J. Guidry, and B. T. Weinland. 1981. Concentrations of corticosteroids, leukocytes, and immunoglobulins in blood and milk after administration of ACTH to lactating dairy cattle; Effects on phagocytosis of staphylococcus aureus by polymorphonuclear leukocytes. Amer. Journal of Veterinary Research, 42:20081. 19.Phillips, D. S. M. 1962. Production of cows may be affected by small electrical shocks from milking plants. New Zealand Journal of Agriculture, 105:221. 20.Plaizier, J. C. B., E. J. King, J. C. M. Dekkers, and K. Lissemore. 1997. Estimation of economic values of indices for reproductive performance in dairy herds using computer simulation. J. Dairy Sci., 80:2775-2783. 21.Scott, R. N., R. C. Gorewit, and D.V. Drenkard. 1984. Effects of electrical current on milking and behavior. Proceeding of the National Stray Voltage Symposium (page 33), October 10-12, 1984. Syracuse, NY, American Society of Agricultural Engineers. 22. Statistics and Probability Department, Consulting Service, Michigan State University, East Lansing. 23.Stoebel, David P., and Gary P. Moberg. 1982. Repeated acute stress during the follicular phase and luteinizing hormone surge of dairy heifers. J. Dairy Sci., 65:92-96. 24.Wegner, T. N., J. D. Schuh, E. F. Nelson, and G. H. Stott. Effect of stress on blood leucocytes and milk somatic cell counts in dairy cows. J. Dairy Sci., 59:949. 25.Whittlestone, W. G. 1951. Studies on milk ejection in dairy cows. The effect of stimulus on the release of “milk ejection” hormone. New Zealand Journal of Science and Technology. 32A(5):1. 26.Whittlestone, W. G., M. M. Mullard, R. Kiljour, and L. R. Cate. 1975. Electrical shock during machine milking. New Zeakand Veterinary Journal, 26(6):105. 27.Wilson, S. J., R. S. Marion, J. N. Spain, D. E. Spiers, D. H. Keisler, and M. C. Lucy. 1998. Effects of controlled heat stress on ovarian function of dairy cattle: 1. Lactating cows. J. D. Sci., 81:2124-2131. 28.Wilson, S. J., C. J. Kirby, A. T. Koenigsfeld, D. H. Keisler, and M. C. Lucy. 1998. Effects of controlled heat stress on ovarian function of dairy cattle. 2. Heifers. J. Dairy Sci., 81:2132-2138. Figures from: D. J. Aneshansley, R. C. Gorewit, D. C. Ludington et al. Paper #87-3034. 1987. Am. Soc. Agr. Engineers (Baltimore, Md.). Figure 11: Milk Production Decline. Figures 2A and 2B: Water Consumption. Figures 12A and 12 B: Feed Consumption. Paul Halderson is pictured on his Galesville dairy farm in this 2005 file photo. Halderson sued Xcel Energy for more than $4 million claiming stray voltage from the Minnesota-based utility’s lines harmed his herd for nearly 20 years. A Galesville farmer has won his five-year legal battle against Xcel Energy over stray voltage that he says harmed his cattle and could result in a record $13.5 million award. A jury this week found that Xcel was negligent and failed to follow state regulations, causing more than $4 million in losses for Paul Halderson and his wife, Lyn, who operate a nearly 1,000-cow dairy. The Haldersons claimed their herd suffered from illness and decreased milk production for more than a decade because of improperly grounded power lines. In total, the Trempealeau County jury awarded the Haldersons about $4.5 million, which the court is required to triple in cases such as this where a jury finds willful, wanton or reckless violation of statutes. That would be the largest stray voltage award in Wisconsin history and likely the second largest in the nation, said Halderson’s attorney Barry Hammarback of River Falls, Wis.
“It really was quite a vindication,” Hammarback said, noting that the Haldersons had to endure accusations they were sub-standard farmers. Paul Halderson, a longtime member of the Gale-Ettrick-Trempealeau school board, said he would rather have avoided the lawsuit but was relieved to get compensation for a problem that began as early as 1993. The term stray voltage refers to current that leaks from neutral wires into the earth. Animals that come into contact with a grounded object — such as a watering trough — can receive small shocks. This can cause dairy cattle to avoid eating, become stressed and generally produce less milk, according to research from the U.S. Department of Agriculture. Wisconsin’s Public Service Commission established guidelines in 1996 for acceptable levels of stray voltage for utility service, although a farm or home’s own wiring can also be the source, said Doug Reinemann, professor and chair of biological systems engineering at the University of Wisconsin-Madison. According to the Haldersons’ suit, NSP found excessive voltage in one of their barns beginning in 1996 but failed to report it. In 2011, the Haldersons hired a consultant who found high levels of electricity and concluded it was coming from the utility’s distribution system. The suit claimed this led to reduced milk production and the loss of $5.8 million in profits between 2004 and 2011 when Xcel installed equipment designed to reduce stray voltage. Hammarback said after new equipment was installed, the cows’ reproduction rates nearly doubled, mortality plummeted and overall production increased by 5 million pounds of milk per year. Also named in the suit was Star Blends LLC, which the Haldersons said provided bad feed in June 2011 — shortly after Xcel installed equipment to address the stray voltage — that killed some of their cows and left others sick. The Sparta feed company settled out of court for an undisclosed sum. The utility claims “no one detected harmful currents” where cows were present and says Halderson’s problems resulted from his expansion during difficult times for the dairy industry, bad feed, disease and inadequate veterinary care, and poor conditions for the cattle. Arctic View expanded its operation in 2001 and 2005, growing the herd from around 200 cows to more than 900. Xcel says it tested for stray voltage each time new wiring was installed and did not find significant levels. In 2010 a Grant County farmer won a record $5 million settlement against Scenic Rivers Energy Cooperative, and last year the Minnesota Court of Appeals upheld a $9 million verdict against Crow Wing Cooperative Power & Light Co.